Mybf has a whole week off but he'll be very busy over the next few weeks. So, I've been quite busy stuffing myself and eating out spending time with him that I couldn't write much. Unless if he is watching DVDs, then only I have time to do a bit of blog hopping. Anyway, we went to Old Taste Cafe, again. 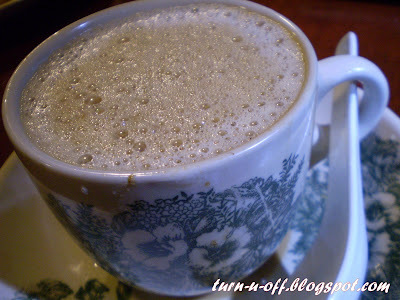 Remember I said I will return for their Orange white coffee? Orange white coffee (RM3.80). I love it as it does have a very strong orange flavor. 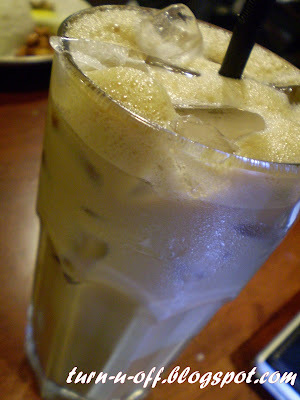 Iced orange coffee (RM4.20). I have to say that it was very refreshing and unbelievably good! 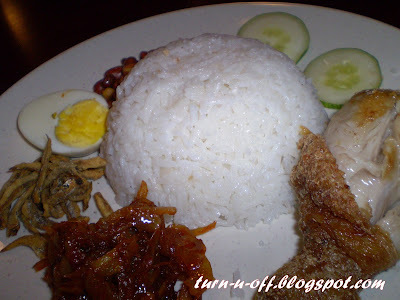 The nasi lemak with fried chicken (RM7.90) was ok. But, I would recommend this place to you if you're craving for good nasi lemak!!! Really? Ok, I'll try their honey lemon tea next time.. I like their milk tea very much! One word to describe it!